Do you carry water bottles with you when you travel? It’s a great way to save cash. The last time I bought a bottle of water at an airport, it cost me $3.69. I was in Mexico, so I figured it was worth it to know I was drinking safe water. When I travel somewhere I know the water is safe to drink, I never buy bottled water. I’m too cheap. I always travel with a refillable bottle, empty it before going through security and refill it at the first water fountain I see. I figure I save a minimum of $10 every trip–more when I visit hot climes. 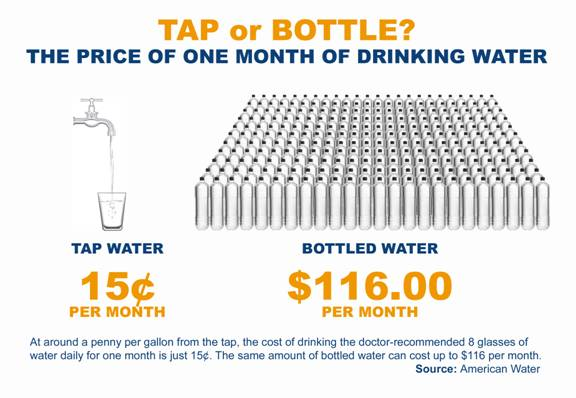 But when I saw a graphic showing that one month of bottled water can cost $116 versus just 15 cents for one month of tap water, I figured I might be saving even more. Multiply that cost by the number of people in your family, and it’s clear that refilling a water bottle is one of the easiest ways to save money, whether you stay home or head off on a family vacation.